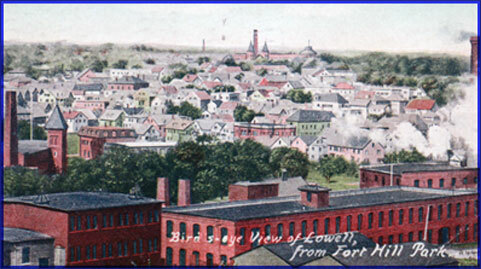 The story of Lowell has been told a thousand times—how a group of men chose a site on the Merrimack where the falls could provide them with ample waterpower to build a great city of textile mills. How they used the cutting edge technology of their time, some of it stolen from England. How their actions jump-started the Industrial Revolution in America. How they employed farm girls from around New England and by so doing unintentionally triggered advances in social causes. The story has been told from a host of angles: from architecture to engineering to women's rights to the labor movement. But never from dance, a social and artistic activity that overlaps many of the other categories. It was never Ruth and Charles' intention to tell it from that angle either. They simply wanted a bit of background so they had a clue who was doing what where before they put together a little choreography or two for possible use around Lowell. The project kinda got away from them and they eventually put together a book. Carefully researched, heavily illustrated, and full of interesting tidbits (including the skinny on Lowell's infamous 1914 Tango Trial), Twirling Jennies: A History of Social Dance (and other mischief) in the City of Spindles 1820—1920 is now available online and in select stores. Additionally, later research resulted in the Tale of Two Ballrooms finding its way online.